A banner on the regional Pacific operations center in Millersburg. The fight over electric power in Millersburg is about to enter another round. The Millersburg City Council will hold a second public hearing tonight (June 19) on its proposal to kick Pacific Power out, take over the town’s electric system, by condemnation if necessary, and run it as a municipal utility. 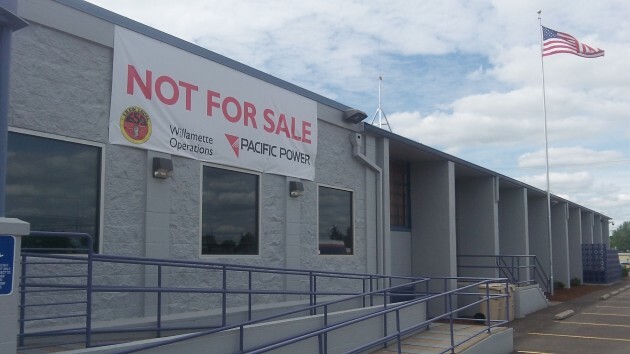 Pacific Power is expected to use the hearing to drive home its arguments that this venture is already costing Millersburg citizens money and will likely cost them much more later. The hearing is from 6 to 8 p.m. at the Linn County Expo Center. The first one was held May 20, but this one is likely to feature more of a pushback from Pacific than the first. Pat Reiten was smiling Wednesday but wasn’t taking the Millersburg situation lightly. Pat Reiten, the CEO of Pacific Power, was at the company’s operations center in Millersburg Wednesday talking with various people. 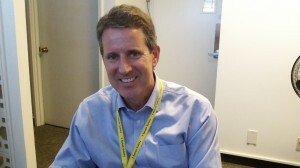 In an interview, he reiterated Pacific’s determination to fight the takeover to the very end. The company has been gathering signatures from Millersburg residents opposed to the takeover. What this suggests is that the utility is prepared to take its case to the voters if the council pushes ahead with the proposal on its own — without an election. The council would probably have to authorize a bond sale in order to launch a condemnation proceeding, and an ordinance to that effect would be subject to a possible referendum to block it or an initiative to repeal it. On Monday, Pacific made public a timeline of behind-the-scenes discussions about the municipal utility plan involving ATI Wah Chang, the city of Millersburg, a Portland law firm and consultants starting in October 2012. The company made the timeline based on records it obtained from the city under Oregon’s public-records law. “The records show that the plan was intentionally developed out of public view and before the public and Pacific Power were made aware,” Pacific said in a press release. It would be worth mentioning that Pat met with several (individually) of the City Council members yesterday. Well I guess City Attorney Forrest Reid will be able to get that new BMW ! It came out in last months Council meeting (brought up as a concern of the Mayor) that the EES Consulting firm has been paid double what was budgeted. Apparantly initial quotes were $5K that were revised to $15K… it now nears $30K. The City has no money to pay EES or Reid their current bills out of the current budget, they wont be paid until after July 1. EES will have more costs to the City associated with tonights meeting. So would a MUD operation surpass budgets and start up costs… probably. On all the private meetings, private contracts (some redacted) that the Council refuses to disclose to the public…maybe it is time the State Attorney General’s Office gets involved to investigate if State open meeting laws have been violated. There is also talk, that if the Council proceeds with the MUD project, especially without a vote of the citizens, recall elections may be pursued. If you go with a $50 million dollar start up costs, bond indebtedness, at 800 businesses and residences in town; that is a debt ratio of over $56,000.00 for every house and business in town. The City Planner in last month’s meeting had also stated that citizens should expect NO decrease or savings in the first three years of a MUD operation. Pacific Power has just disclosed their own study on this issue. It is a good read, an easy read and I hope every Millersburg resident reads it ! I have not heard of one citizen or business in Millersburg that has complained about their electric bill from Pacific Power…not one! Wait a minute… oh… I forgot, Wah Chang has (but not one other customer!!!. If the Council agrees to proceed with a MUD, the citizens then need to vote on whether to continue and approve or disapprove of it !